I have no idea why I have not visited Zest before now. Not far from where I live, in a central location, it’s a perfect meet up place for curry. We’d been invited along to put it through its paces. We were seated in the window (great for people watching) and picked a few things from the menu. However, we were then offered to try a few additional things. Whilst we knew we wouldn’t be able to finish them, we couldn’t say no to such a generous offer either. We started off with some poppadoms and chutney. I was pleased to see how large the chutney portions are. Mango chutney is always sought after and it was nice not to run out. All three offerings were great. We then each got a plate of assorted kebabs, onion bhaji and prawn Puri. Each item was delicious, going back and forth on which was our favourite. I think I settled on the prawn puri and my friend decided on the chicken. The bhaji could have taken a bit more spice but was still tasty. The lamb was great too. We were brought four curries to sample – lamb rogan josh, chicken P297 (named after an Edinburgh taxi driver), spinach and paneer, and a green herb king prawn curry. Again, we went back on forth on which one was our favourite. Each curry had its own personality. The chicken had depth, the lamb some spice, the spinach and paneer had bags of flavour, and the prawn some mellowness. Somewhat surprisingly for me, I think my favourite was the spinach and paneer. We had a garlic and paratha naans which were also excellent. The garlic naan had shed loads of garlic on, just as I like it. The paratha naan was billowy. There was no way we could fit in dessert but thoroughly enjoyed all the food we tasted. We will definitely come back for another visit. Complimentary but likely to cost around £40 for a meal for two without alcohol. Whilst this meal was complimentary, all views expressed are my own. Thanks to Hotel PR for organising. This place came as a recommendation from a work colleague who was new to Edinburgh. Rustom has recently opened on Haymarket and has really made an effort to look sparkling for its customers. I decided to try their pan fried garlic paneer followed by chicken bhuna. My friend opted for the fish pakora and then palak gosht. We both got some garlic naans to go with our curries and a couple of poppadoms whilst we waited (obviously). The starters arrived with the usual salad accompaniments which most people leave. My paneer was cubed and tasted delicious with it. Crispy on the outside and soft on the inside. There was a dip on the side which also added a bit of flavour. My friend’s fish pakora was generous in size, with three large pieces. She thought it was excellent value. The mains arrived in quite hot dishes and I had to use my napkin to protect myself when lifting off the lid. My chicken bhuna was full of chicken pieces which was a pleasant surprise. You usually have to hunt for the protein in curries but not here. The sauce was good, providing a decent curry flavour. The naan was excellent and lots of garlic goodness. Across from me, my dining companion was really enjoying her palak gosht. Consisting of lamb and spinach which was slow cooked in spices, this dish was really tasty and felt a little bit different. The service was very good throughout – attentive without pestering. If you are in the area, it’s worth a visit. £50 for a couple of poppadoms and chutney tray, two starters, mains and naans. There is a little, unassuming frontage to this restaurant but it’s massive inside and even has an outdoor seating area out the back. We had a relatively early sitting but there were already diners inside and plenty more came in during our meal, indicating that this is a popular place. It’s not surprising considering one of their chefs recently won chef of the year at the Scottish Curry Awards. We started our meal, as we often do with curry, with poppadoms and chutney. The poppadoms were of high quality and whilst devouring the mango chutney, I was also really impressed with the mint and yoghurt sauce, which was refreshing. We decided to share a starter between us and opted for the assorted kebab selection. This consisted of two chicken pieces, one lamb and a pakora. Both the chicken and the lamb were succulent and all of the kebabs had some nice spicing. I’d ordered a chicken tikka balti and my friend chose the garlic chilli chicken. We both got a garlic naan and shared some rice. The waiter place some of the rice on our plates and then we got stuck in. I think this balti is the closest I have found to those in the Midlands in the Edinburgh area. The flavour was great, the sauce was rich and there was plenty of meat. The naan was huge and scooped up the curry well. The rice was also great. Across from me, the garlic chilli chicken was juicy and full of heat. We both really enjoyed every mouthful we ate. We were so full we couldn’t manage dessert but there are plenty of options on offer, should you wish to partake in one. The staff were lovely and friendly throughout the meal and were clearly liked by other regular patrons who were in that evening. The Radhuni is on the 37 bus route so if you are not local to Loanhead, it’s really easy to get to and from the city centre. It’s worth it as the food is yummy. Whilst this meal was complimentary, all views are my own. Thank you to Scott from Hotel PR for organising the visit. Situated on South Bridge, Roti offers Indian food, with tapas being a specialty. A colleague had suggested lunch here as they had some good lunchtime deals. These consisted of a few different thali options along with some Indian fast-food fusion hybrids, which sounded unusual to say the least. I am a big fan of thalis so I ordered the non-vegetarian one and one of my dining companions chose the vegetarian version. The last of the three of us went for one of the slightly more unusual options and picked a tikka burrito. We had a bit of a wait for our food, but unsurprisingly, the thalis looked great on arrival. Each had three different curries. On the non-vegetarian tray, one was lamb, one was chicken and the last was vegetarian. Additional to this were a couple of pieces of chicken with a dip, a naan and some rice. Each of the curries were different rather than being various meats with the same sauce and all had their own personalities but worked well as a meal. On the vegetarian version, the curries again were all different and came with naan and rice but had bhajis instead of the chicken. We were both suitably impressed and filled by our thalis. The tikka burrito did look a little bit sorry for itself in comparison. Certainly a size for those who like a lighter lunch but at a cheaper price, this makes sense. The burrito came wrapped in foil and had a sauce to dip into or pour. My friend enjoyed the flavours and gave it the thumbs up, even if she did have a bit of thali envy. My two friends decided to order a mint tea and a latte. After what seemed like an inordinate amount of time (I’d say at least 15 minutes) the tea arrived and we were informed that it could be another 10 minutes for the coffee as the machine needed to warm up. We decided to wait but only because the tea had already been delivered. All very odd. Roti offers value for money and the food was nice. However, don’t consider this a place to fit a lunch into an hour lunch break as there won’t be enough time. Cost £26 for two thali, a burrito, a tea and coffee. 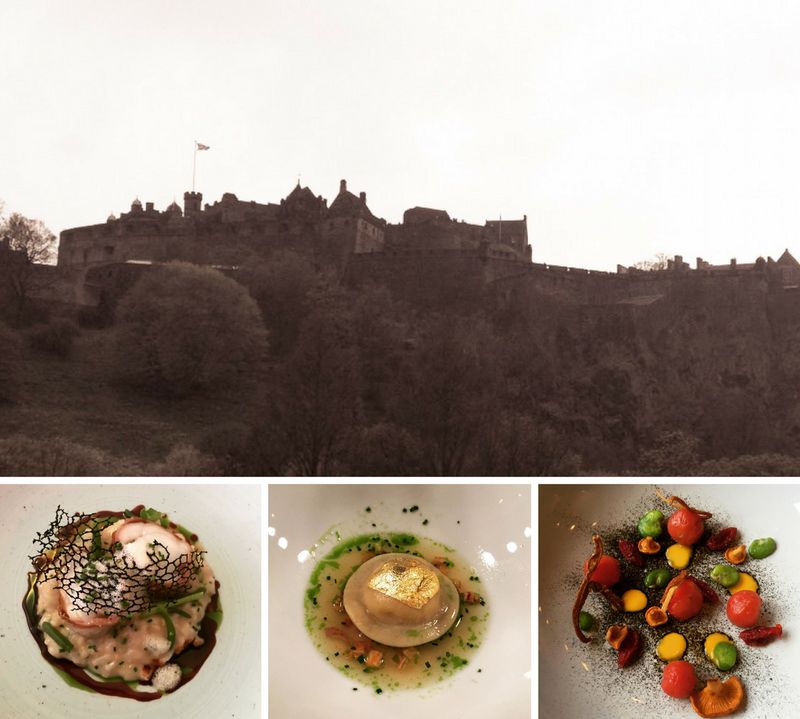 Ronaq recently opened a second restaurant by Waverley, their first being in Comely Bank. Inside, this restaurant was decorated in a slick, modern style, with the main restaurant area based on the upper floor. We were seated by the window, which although overlooks the council building, also does have views of Calton Hill. We were offered some poppadoms whilst we looked at the menu, which we obviously agreed to. We ordered a couple of cocktails and I decided to skip a starter and go straight to ordering a chicken chasni and my friend chose fish pakora to start, followed by the Ronaq special curry. The poppadoms were lovely, with good crunch. The chutneys were also excellent. The fish pakora arrived and I have to say we were a little disappointed in how they looked, as they resembled more of a frozen battered fish fillet than pakora (apologies that the photo is only showing two rather than three pakora – my friend was very hungry!). They tasted ok, as I got to sample one, but it really wasn’t anything special and lacked the texture I would normally expect. The curries came next and both looked and smelt great. The service dishes seems a little shallow in comparison with other restaurants, which isn’t really a problem in terms of volume as I usually struggle to finish a curry, but seems a little stingy based on price. The chasni had peppers, onions and mushrooms as well as the chicken in it. The Ronaq special consisted of a mix of chicken, lamb, mushroom, prawn and lentils. Both were pleasant enough but lacked a bit of personality and depth of spice, resulting in neither of us being wowed by them. The garlic naans we both had were delicious though and stood up to the curries well. Ronaq is pleasant enough but a little underwhelming overall. Cost £60 for poppadoms, chutneys, one starter, two mains, two garlic naans and two cocktails.